I really should have posted this yesterday. Forgive me won't you? I'll tell you what I would recommend. I would recommend that those people get their heads out of their asses. But if I had to suggest a book to such a person it would be Black Like Me by John Howard Griffin. 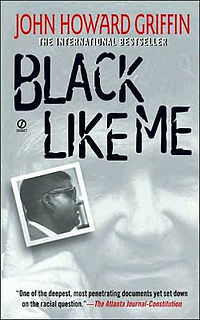 Black Like Me was first published in 1961. I read it in 1991 or so. I haven't read it since and I'm thinking it might be time for a re-read. I've read it! I totally forgot about this book! Maybe someone mentioned it or I had to read a book off a certain list, but this is the one I chose for some sort of high school history book report thing. What a great book! I remember the premise and that I loved it. I am sure that the book would have a much deeper impact if I were to reread it! I haven't read it, but do recall, from being young in the sixties, what it felt like to see what bigotry did to people who were living in the midst of it, and to know the impact of the Civil Rights movement.